Steel deck or metal deck is the material used for composite floor decks construction. They serve as a surface for either a floor or roof. However, they have been more known for establishing flooring system. 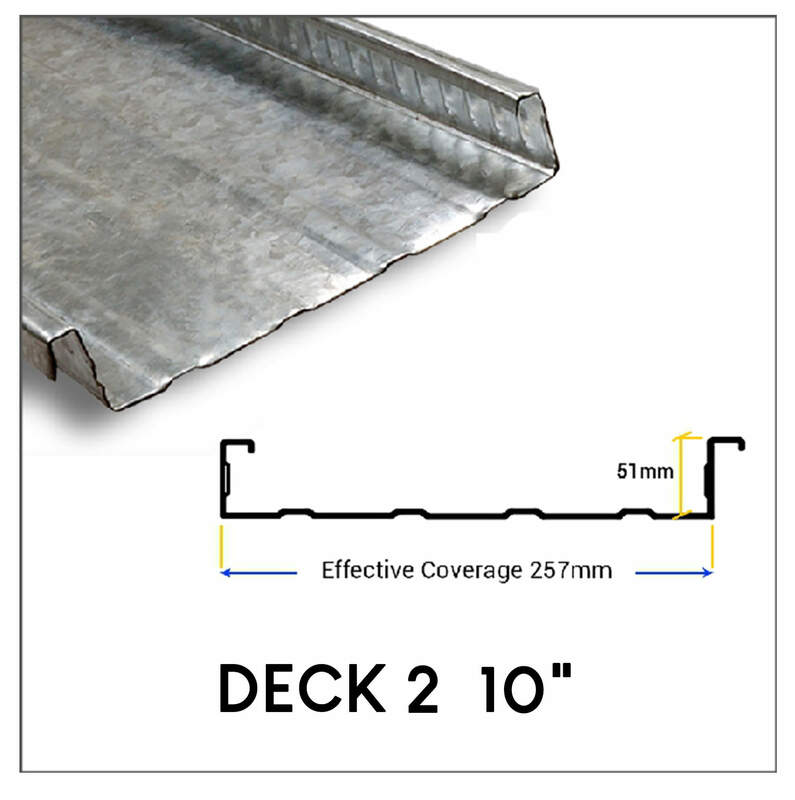 The base material of steel decks are high quality sheet steel formed to be fastened together across joists. 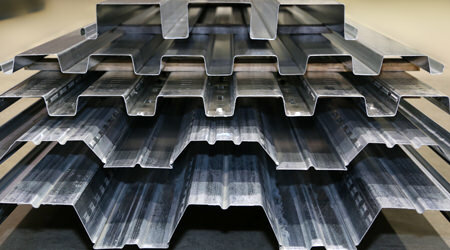 There are multiple kinds of steel deck each with different thickness and design. They are manufactured to meet different loading conditions and spans. Some examples of these designs are discussed below. Their design is able to efficiently utilize the properties of steel in order to create a high strength-to-weight ratio. With this, steel decking brings several advantages in erecting structures. Moreover, they have been widely practiced and applied to different application (residential and commercial) for a long period of time and has been proven effective due to its effectivity and durability. We have three (3) variation of steel decks available in 0.8. 1.0 and 1.2 millimeter of thickness. 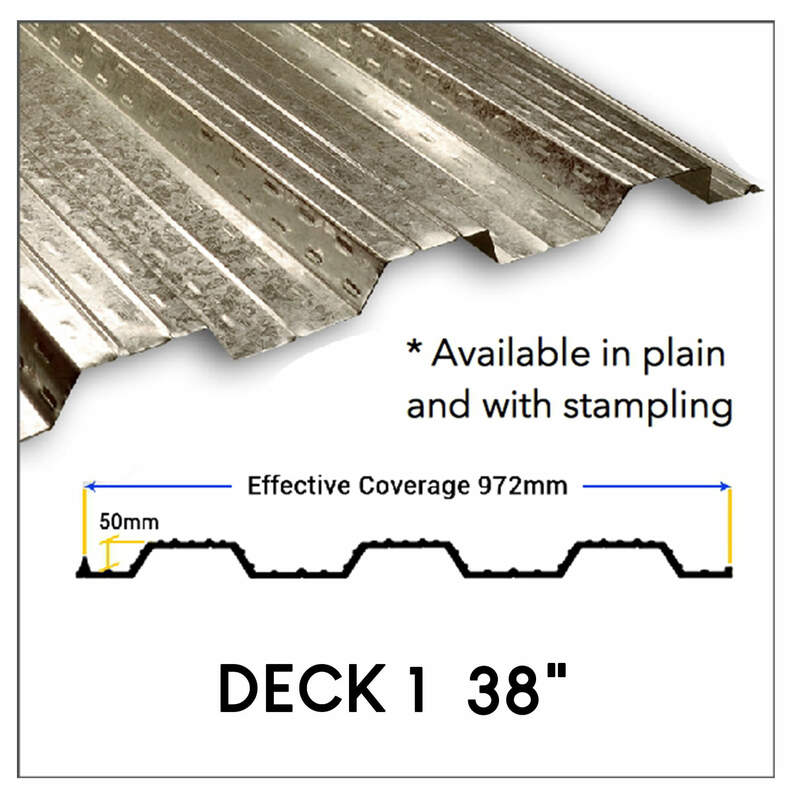 Manufacturers have several design when it comes to steel decking, each with their own technical specifications. In terms of their span, their effective coverages are 972(mm), 257(mm) and 51(mm) respectively. 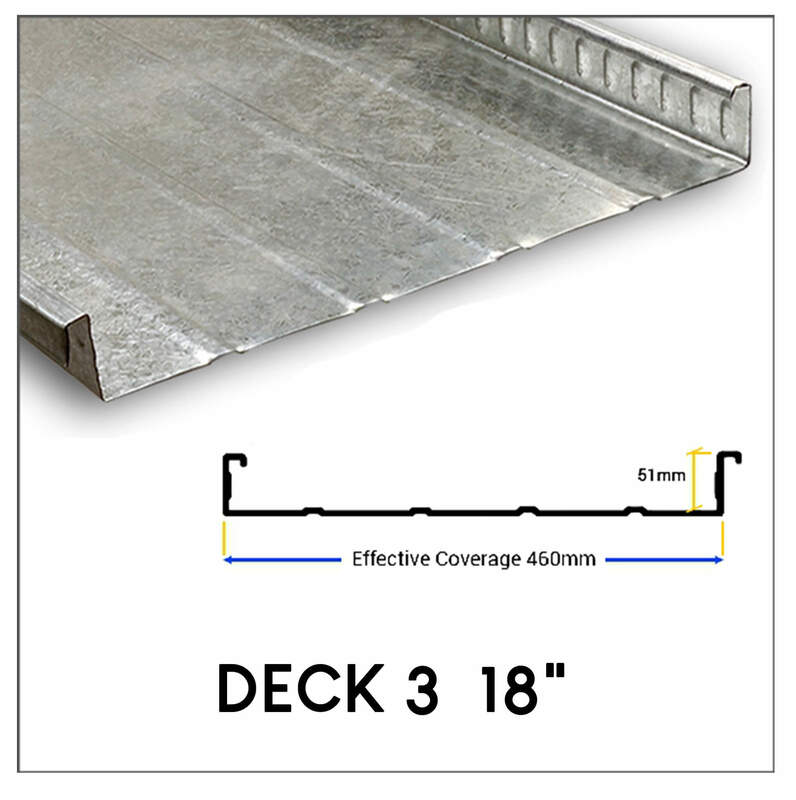 The practice in which steel decks are used is known as composite floor decks. The basic building block of this application is further known as a composite floor slab. 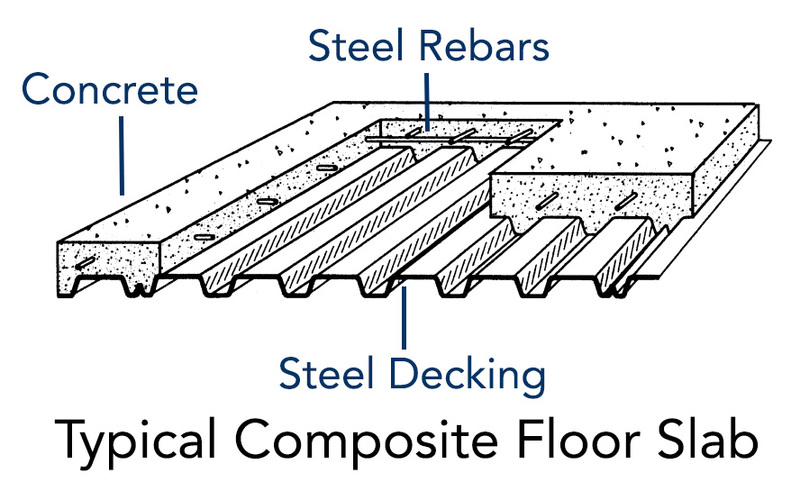 There are three (3) materials used in constructing a composite floor slab; steel decks, reinforcing bars and concrete. All these are tied together to make up for a single composite floor slab. For building the composite slabs there are three things we need to consider. The chart summarizes the computation of the recommended steel reinforcements. This is taking into consideration the slab thickness and the diameter of the rebars. To be clear, let us give an example through the first row. Given that the thickness of the concrete slab is 100mm and the reinforcement bars that will be used is 10mm of diameter. Based on the given inputs and the chart, it is recommended to have a spacing of 350mm for the steel reinforcements. Where to Buy Steel Decks? Steel decking at its core is made up of galvanized steel. 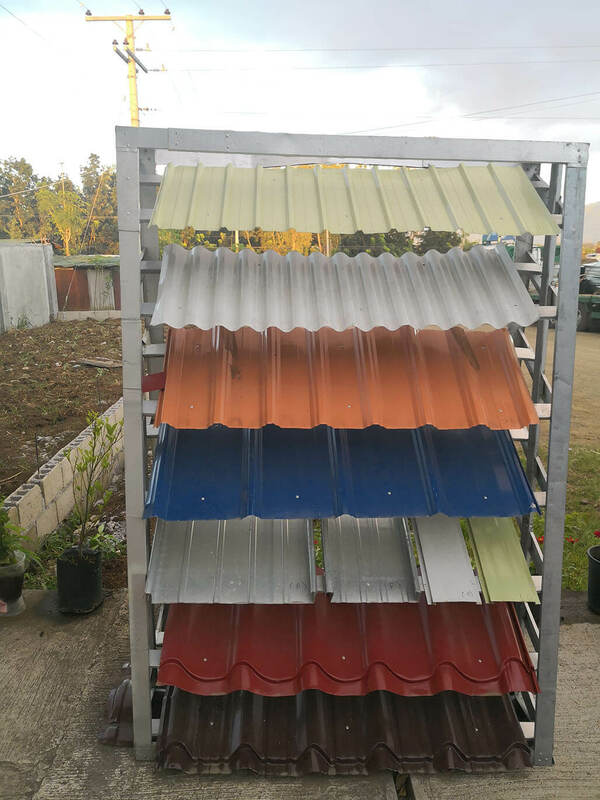 This is often associated with steel roofing products since they are made up of the same material. That is why your best bet is looking for a roofing supplier. Fortunately, in my country we developed a common symbol of a roofing store. These stores have a stand that looks like the image. So if you’ve seen this, they are likely selling steel decks. On a side note, we also manufacture and deliver steel decks. Learn more on how to order by clicking on the link. One notable trait of composite slabs are their fast erection. Multiple metal decks can be transported by a crane at once. This leads to less crane time. Moreover, once the decks have been established, it can be further used as a working platform for other trades which leads to faster project completion. Even though that steel decks are for structural purposes, it can be visually attractive when left in its raw form. Additional aesthetic paints can also be applied below the material when used as a ceiling. This gives designers an added flexibility with their conceptual design. Unlike other flooring system, they can be constructed in most weather conditions. This eliminates delays of the completion time of the project. 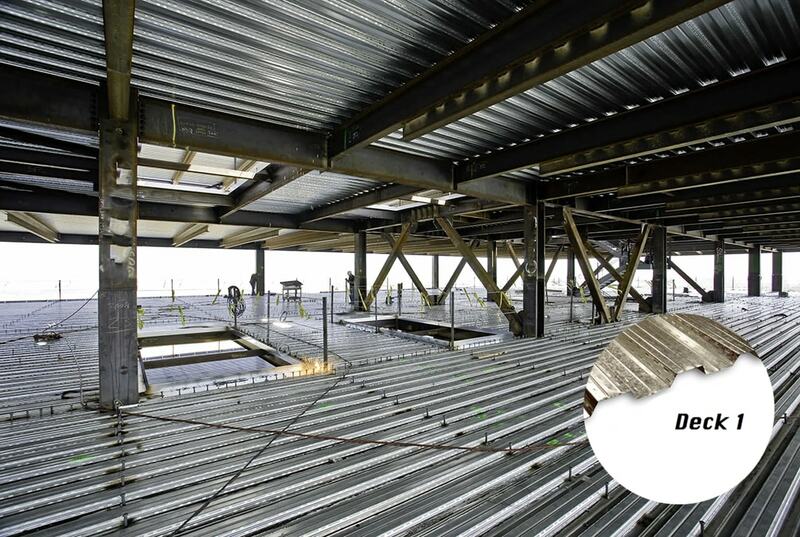 Moreover, once the steel deck has been constructed, it can act as a cover for workers below from falling objects. Because of the composition of the floor slab (the combination between rebars, steel deck and concrete), this results to the maximum efficiency of steel. Through this composition, they achieve a stronger and lighter results compared to traditional or non-composition slabs. The application of steel decks in building composite slabs has been practiced for over 60 years. Through the years they have been proven to be effective in building different kinds of structures. The lightweight property of steel decks make it easy to move them from one place to another. From manufacturing to transportation to installation, they are considered to be one of the simplest material to be handled in construction. Another thing to look at is that concrete slabs has an average length of approximately 15-feet. Correspondingly, the metal decks will have the same length. Because of this, they can be transported by less weight/length intensive vehicles. This is related to the previous benefit discussed above. Because of the fewer materials needed to construct floor system, this results to cheaper overall material costs. Aside from initial costs, they also bring longevity in their lifecycle as they are resistant to moisture and pest deterioration. This contributes to the overall value of the material.